Limited Repress on Gatefold Sleeve. INCLUDES BONUS SIDE OF INSTRUMENTALS. 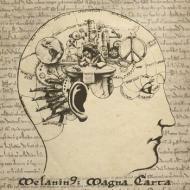 Magna Carta LP featuring Roc Marciano, Triple Darkness & Madame Pepper. Production from Jehst, Anatomy, HeyZues, 7th Dan, Parental, Ohbliv &Tony Mahoney.